- 25 years of talk and t-shirts has done nothing to keep Melbourne’s plastic trash off southern bay side beaches. The Yarra and its major tributaries drain the City of Melbourne and the suburbs to the North and North West and East. These major tributaries include the Maribyrnong and Plenty Rivers and Jackson’s, Merri, Darebin, Mullum and Gardiners Creeks. Via the bay, these streams directly connect this huge catchment to the bay. To the south Mordialloc and Dandenong Creek/Patterson River provide the same environmental “service” to a far smaller catchment. Once drifting litter leaves the Yarra it’s carried by the bay’s predominant clockwise currents south to beaches in Port Phillip, Bayside, Kingston, Frankston and the Mornington Peninsula Shire. How far it carries is determined by the amount of rain that falls in the Yarra catchment, tidal heights in the Yarra and the strength and duration of the Northerly winds. Rivers of this mixed garbage can be regularly seen in the bay post the more significant annual rain events that characterize Melbourne’s weather. The main drains and the beds and banks of the creeks and rivers are managed by Melbourne Water. The minor drains are generally managed by local government. Sustainability Victoria and ultimately Environment Minister Ryan Smith and his departmental Secretary Greg Wilson preside over policy and the allocation of resources for infrastructure , services education and enforcement. Each year the bay side Municipalities spend hundreds of thousands of dollars collecting drift litter from their local beaches. The mechanical clean-up process removes all material from the beaches including the natural deposition of vegetable material. This impairs the beaches natural ability to protect itself from erosion. Mechanical cleaning doesn't collect the trash that is blown into areas inaccessible by the tractors. This year Clean up Australia Day fell on the 3rd of March. Hundreds of central and southern bay side residents turned out to pick up trash that arguably should have been stopped in its track by municipalities to their north but more particularly by Melbourne Water who are responsible for most of the main drains and who are reluctant to fit effective trash traps because of the cost of their clearance. This means that the cost and responsibility for retrieving this trash has been effectively shifted to the bayside municipalities to the south and volunteers who walk the beach in the course of their everyday lives or who turn out on Clean Up Australia Day. On the Kingston section of the bays longest beach there were 8 Clean Up Australia sites that spanned the beaches from Mentone to Carrum. Trash of identifiable origin has been found from Port Melbourne to Blairgowrie. 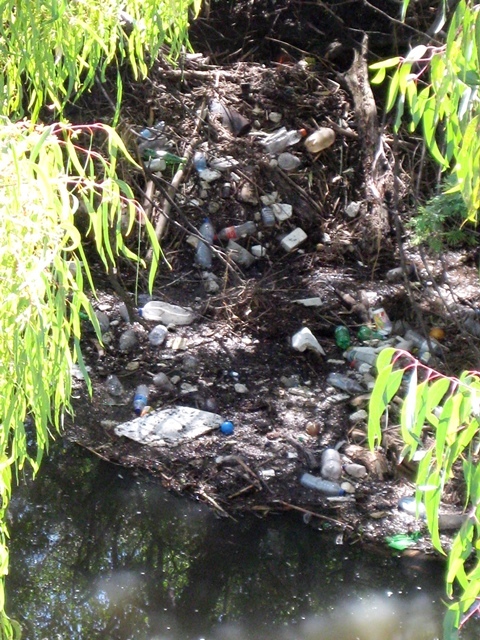 The impact of plastic trash on bay wildlife is unknown. However it is known that seabirds and fish do ingest plastic trash that mimics feed. Extensive lines of plastic detritus can be readily observed trapped in the Seaford Beach and other dune systems. Cyclical erosion events release this trapped material much of which is resistant to ultraviolet degradation and much of it breaks into increasingly smaller pieces as it is milled on the sand by breaking waves. 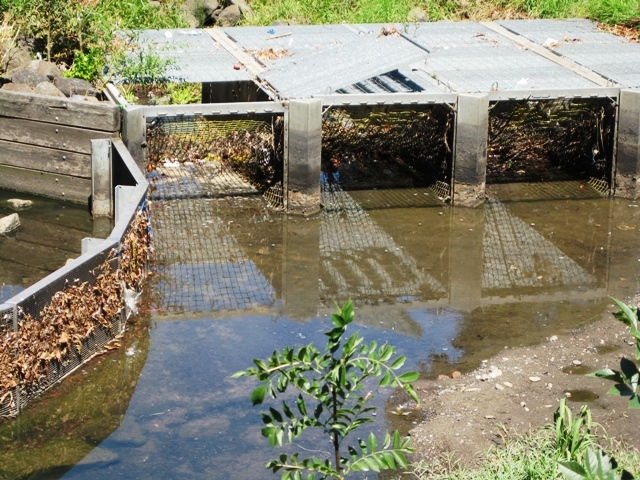 Bayside, Kingston, Frankston and Mornington Peninsula (and Dandenong) councils have all fitted high performance centrifugal litter traps to known problematic drains. These traps will remove cigarette butts, syringes and particulates smaller than a match head. Mesh bag traps don’t do this. So why don't the northern bay and Yarra municipalities including the City of Melbourne and Melbourne Water use these high tech traps to keep their crap off our beaches? The answer is the cost of their clearance. It's cheaper to "educate" than provide expensive “end of pipe” solutions meaning that its cheaper for central and southern bayside councils and their volunteer rate payers to pick it up than stop it at its source in the City of Melbourne or other Yarra side municipalities. So when you are done doing your bit on the MacDonald sponsored Clean up Australia Day you might spend a moment venting your displeasure at Minister Ryan Smith, Lord Mayor Robert Doyle, the Chair of Melbourne Water Paul Clark and whoever currently overseas the Victorian Litter Action Alliance. The Alliance’s deliberations are overseen by Sustainability Victoria . The Packaging Stewardship Forum who recently lobbied to block container deposit regulation participates in the Alliance. What is needed is effective infrastructure funded by way of a container and packaging tax and not another 30 years of education. Opposite Northcote Golf Course upstream Preston Main Drain. 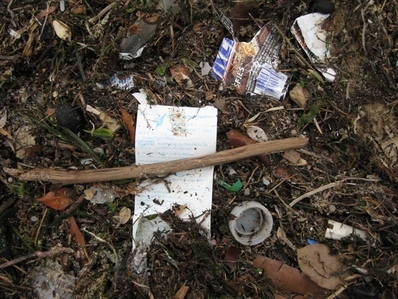 Plastic trash collected from a high water trash line in a two square meter area. Found Seaford Beach 29/11/09 The ticket was issued 31 May 06 - floated round the system for three years. Binned in Port Melbourne 4/9/08, found Seaford Beach 27/9/09. The origin of this has been verified.